Click AMC Theatres coupon image to enlarge for printing. 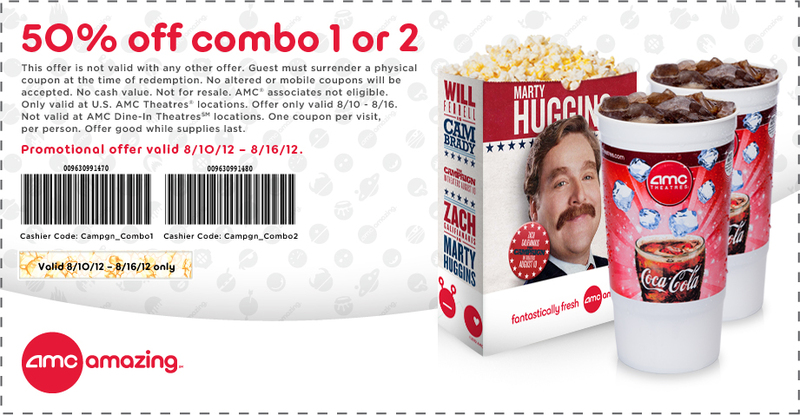 AMC Theatres has released a printable coupon for 50% off combo 1 or 2 effective Friday, Aug. 10 through Thursday, Aug. 16, 2012. Print out this coupon and present it to the cashier. No mobile coupons accepted. Combo 1 is a large popcorn and large fountain drink. Meanwhile, Combo 2 is a large popcorn and two large fountain drinks. Click here to find the AMC Theatre near you.